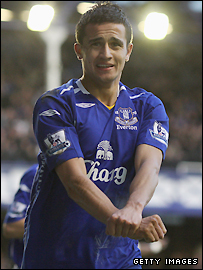 Midfielder Tim Cahill has apologised for his goal celebration during Everton's 3-1 win against Portsmouth. After scoring on Sunday, Cahill crossed his wrists as if handcuffed in a gesture of support to brother Sean, who is serving a six-year jail sentence. Cahill said: "It was a spontaneous and emotional reaction but was only intended to signify to my brother that I was thinking of him and missing him. "I wholeheartedly apologise if any offence was caused." The Football Association (FA) has refused to comment on the incident, other than to say that decisions regarding celebrations rest with the match officials, unless it is deemed that an abusive gesture has been made. Sean Cahill was jailed in January after punching and kicking a man during a fight outside a taxi office in Bromley, south-east London. The attack on 11 July 2004, left the victim partially blinded after CCTV spotted Sean Cahill kicking his victim in the head twice as he lay on the floor. Police found the victim semi-conscious and bleeding heavily and speaking in January, Detective Constable Will Hope described the attack as "brutal and terrifying". Tim Cahill has struggled for form since the turn of the year. His goal against Portsmouth was his first since the end of December and he has admitted it has been an emotional time for him and his family.